Congratulations everyone! Have fun reading Ondine. I've contacted Marjie and Michelle but Dark Angel, I'll need you to leave me a comment with a way to contact you. Don't worry, to save you from spammers I won't publish the comment! The copies will all be paperback due to a block on foreign ebooks. Sorry ereaders! Update: Michelle has purchased both of Ebony's books and would like to pass so that another winner will have the chance to read her novels! That's so kind of you Michelle, thank you. That means Cassandra is now our new third winner! Heather, you go above and beyond for everyone, it's the least we could do. Thank you for your continued support! Lydia, I'm so sorry you didn't win! Many congratulations to the winners! Congrats to the winners and to you Heather, for the new followers! Erica, thank you! It's always fun to find new friends. Here's a "whew hew" for the winners. 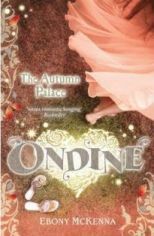 The Ondine books are definitely on my TBR list. Congratulations to the winners. Thank you everyone for adding to the excitement of the competition, and thank you Heather for devoting so much time and blog space for the comp. I'm sorry I wasn't able to send ebooks in the end, but I hope the paperbacks prove just as much fun. Congrats to the winners. It looks like an awesome book. Thanks for the paperback of Ondine. Thanks Michelle, that's really kind. Awesome! Congrats to the winners, and I'm glad there has been so much support. I love this community!